Today its only another quets done by many people on many servers each day. In 2003 it was a time were only a small ammount of servers were present and the Level 100 was still something great to achieve. Only few had this level back then as the update, which would introduce Level doors and quest chests, was planned. As this update was introduced CIP made a private Testserver only for SGMs and CIP themselves. And so it happend that the SGMs Flattery, Faerwynn, Knightmare and Taghor were on the Testserevr together with Steve and Greeny. Knightmare and Steve were showing the new map features and so we came to the Annihilator. 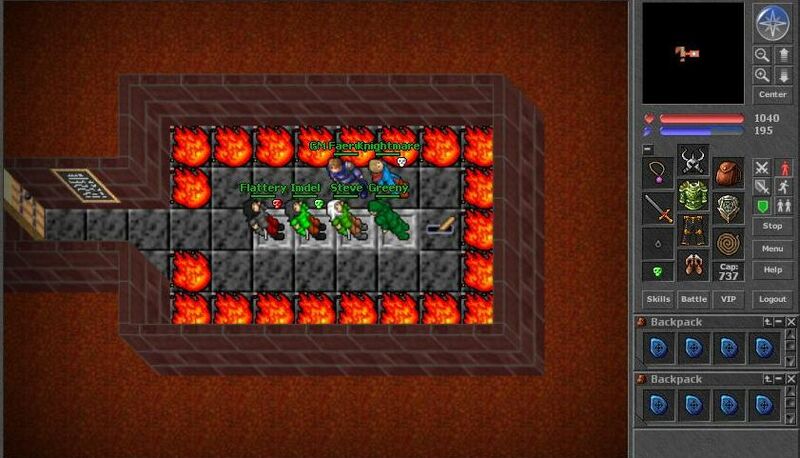 None of us SGMs had level 100 back then so we got extra powers to level up top get past the level door. So Flattery and me went together into the Annihilator with Steve and Greeny who had unkillable God chars. Flattery and me were killed easily and so we teleported back to the reward room. For a contemporary Tibian, using the term “Tibiaball” just goes without saying. On a sundays afternoon you gather some friends, set up a pitch with two goals and start playing good old Tibiaball. But did you ever wonder what the hell came over CIP when they implemented a modern football? And where did the idea come from? Tracing back the very first origins of Tibiaball brings us back to the early days of Tibia or more precisely to the time when Tibians invented pushing. At that time we came very soon up with the idea to use the new discovered technology to push lootbags around, to push players and basically everything that was not nailed down to the ground. Then we started first competitions to measure our pushing skills, like pushing a statue across Thais and finally we came to the idea to set up goals and play soccer. But hey, we did not have any football and how to set up a pitch? Our solutions were very rudimentary and bloody: We used dead fishes and a slain bear and called the game Tibiaball. According to erig.net yesterday there were 3,355 demons kiled on all servers of Tibia and 17,647 in the last week. The only demon who can make a little fear amongst the tibians anymore is Orshabaal but even he was killed 8 times in the last month. Normally the demon was only accesible with a ladder up from cavern city. And only a few of the heroes did dare to enter it’s realm. Hello Tibians and a special “Hello” to Taghor! Even though I haven’t talked to you in about 5(?) years I hope you remember me. I stumbled up on Durin (in a bar in Regensburg) some time ago and since then I am back online in Antica from time to time now. I just found this homepage and since you are looking for old stories I might contribute one. I heard you are mostly looking for stories about where the rare items came from so I start with the story where the first Helmet of the Stars came into the game – or better: into the possession of a player.